This is probably one of the best zombie apocalyptic movies I have ever seen. Not only does it pay homage to George Romero and Danny Boyle, it brings something new to the table. What makes this movie stand out is the fact that it looks at kindness in our darkest moments. It shows how humans can look out for one another, and that those who climb over the weak will suffer miserably. This movie is both fun and gut-wrenching. It is beautifully paced and the characters were excellent. It had just the right amount of horror and character. This movie makes you think about what makes us human in the first place. A divorced dad and his daughter board a train to see her mother. All is fine until a mysterious, infected woman climbs aboard. Then, all hell breaks loose on the train. People are separated, and lines are drawn. They must survive at all costs. Will they? You should watch it and find out! That opening scene with the deer getting hit and coming back to life was gross and awesome! 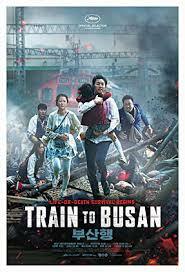 To me, Train to Busan is what World War Z should have been! I highly recommend this to fans of horror and good movies! I agree, this movie was such a pleasant surprise for me. I heard they are remaking it in the US. I hope they don't screw it up! Need more zombie movies like this one.